With a stay at Hotel El Convento in San Juan (San Juan Antiguo), you'll be steps from San Juan Cathedral and 3 minutes by foot from San Juan Gate. 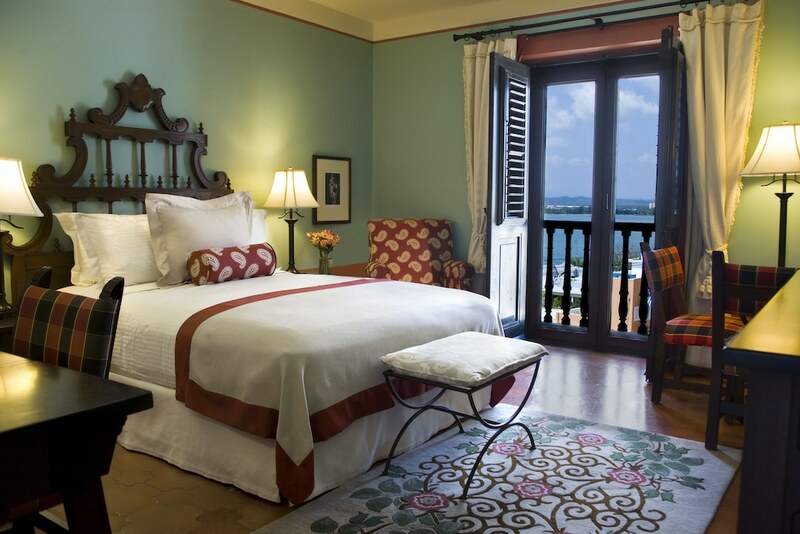 This 4.5-star hotel is 0.7 mi (1.1 km) from Port of San Juan and 0.5 mi (0.7 km) from Castillo de San Cristobal. Make yourself at home in one of the 58 individually decorated guestrooms, featuring refrigerators and LCD televisions. Complimentary wired and wireless Internet access keeps you connected, and cable programming provides entertainment. Bathrooms have designer toiletries and hair dryers. Conveniences include phones, as well as safes and desks. Enjoy recreational amenities such as an outdoor pool and a fitness center. This hotel also features complimentary wireless Internet access, concierge services, and a banquet hall. Grab a bite at El Picoteo, one of the hotel's 2 restaurants, or stay in and take advantage of the room service (during limited hours). Meet other guests and eat at the complimentary reception. Wrap up your day with a drink at the bar/lounge. Cooked-to-order breakfasts are available daily from 6:30 AM to 11:30 AM for a fee. Featured amenities include express check-out, complimentary newspapers in the lobby, and dry cleaning/laundry services. Hotel El Convento is in historic Old San Juan, right across the street from the Puerto Rican Children's Museum and San Juan Cathedral. Also close by are Convento de Los Dominicos and Castillo de San Cristobal. Recreational amenities at Hotel El Convento include fitness facilities and an outdoor pool. Dining options include 2 restaurants and a bar. Patio del Nispero serves breakfast, lunch and dinner in a garden courtyard. El Picoteo is an open-air tapas bar with antiqued masonry walls. Room service is available and a complimentary manager's reception is held each evening. Complimentary bottled water and coffee are available all day in the lounge. A computer in an air-conditioned library provides complimentary Internet access. Complimentary wireless Internet access is also available in public areas. Additional amenities include a concierge desk, multilingual staff, tour assistance, business services, dry cleaning/laundry service and secure outdoor parking (surcharge). There are 7 meeting rooms onsite. This hotel offers accessibility features such as accessible parking. Patio del Nispero - Located in garden courtyard under 350-year-old nispero tree bearing crabapple-like fruit. Potted palm trees. Umbrella-table seating. À la carte breakfast. Lunch menu featuring daily specials, burgers, and local dishes. Dinner menu offers a fusion of international cuisine with a Caribbean touch. El Picoteo - Open-air tapas bar with antiqued masonry walls colored orange, high wood-beam ceiling. Also, terrace seating under awnings and umbrellas. Lunch/dinner menu featuring hot and cold tapas, Spanish-style pizza, paella, sangria. Open Tuesday–Sunday. Room service is available during breakfast, lunch and dinner hours. A complimentary manager's reception is held each evening. A rooftop sundeck is furnished with cushioned lounge chairs. Guests are provided complimentary access to El Convento Beach Club, located a sister property with a white sand beach. An outdoor pool and fitness facilities are also available. Rollaway/extra beds are available for USD 35.0 per night. A resort fee is included in the total price displayed. Only registered guests are allowed in the guestrooms. The property has connecting/adjoining rooms, which are subject to availability and can be requested by contacting the property using the number on the booking confirmation.